The curtain came down on the 2019 CSC Delaware Open at the Vicmead Hunt Club today, in front of a pack crowd, with a very entertaining match and an even more deserving winner. From that point she never looked back as she dominated the “T” from that point from which TSZ-Ling had no answer. 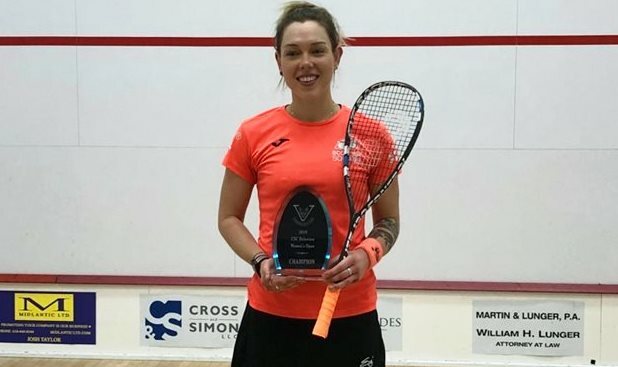 Aitken wins her sixth PSA title, and with her current form she should add to that haul in the future. 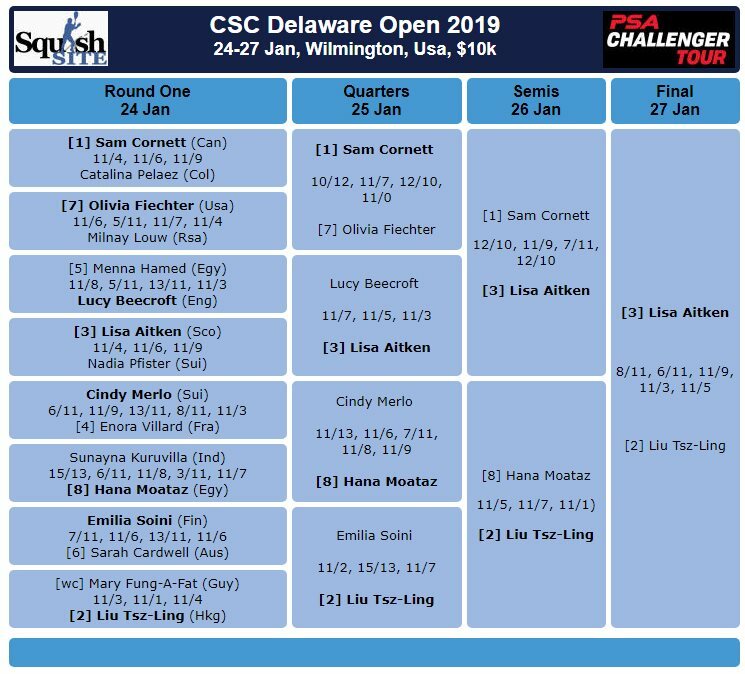 Semi-final night at the CSC Delaware Open was the tale of two matches. 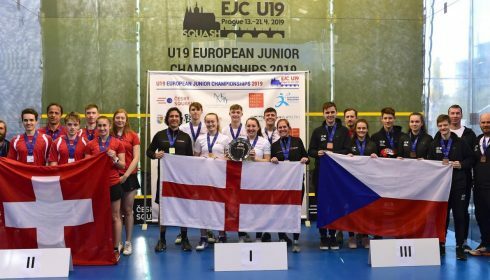 With both top seeds advancing to the semi- finals in fairly comfortable fashion, it was expected that the trend would continue. However, Lisa Aitken of Scotland had other ideas. She came out very determined and cut every ball off not allowing Cornett to get to the “T”, and putting away any loose length that came her way. However, you can never count Cornett out,and she was going to go down easy, even when she could not find her length. The rallies got longer and the court coverage got more audacious. However, just when you thought Cornett was about to pull ahead, Aitken would dig in and play the business end of the game much stronger. Cornett managed to win the third game and was up in the fourth game before an unforced error in the front right corner stalled her progress. 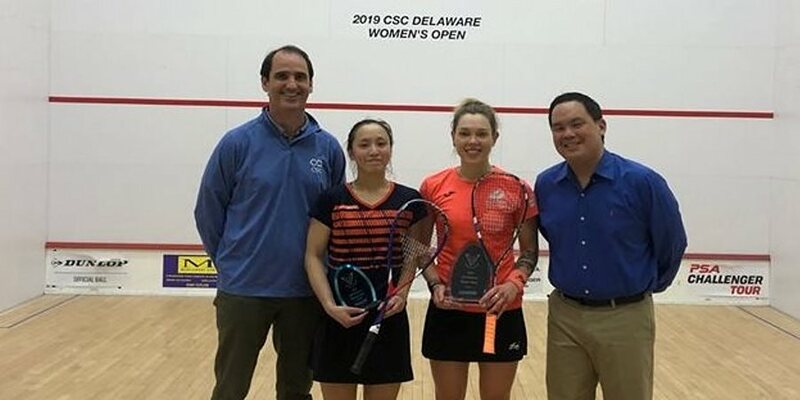 Even saving a match point at 9-10 in the fourth with a gutsy drop off the back wall , Aitken was not to be deterred as she rolled to her first Delaware Open final. Aitken will take on Liu Tsz-Ling who deposed of Hana Moataz of Egypt in straight games. Tsz-Ling of Hong Kong, has had a relatively easy path to the finals but this is because she is very deceptive player, and tonight she sliced and diced her way to the final, using Moataz pace against her. Tomorrow’s match up will see her try to hold back the determined challenge of Aitken, in a match up that again see contrasting styles. 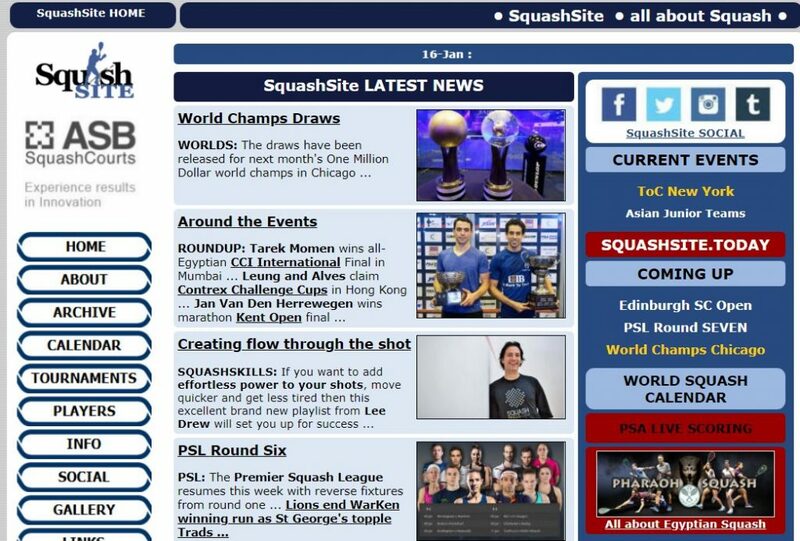 Should provide an entertaining match for the squash fans of Delaware. 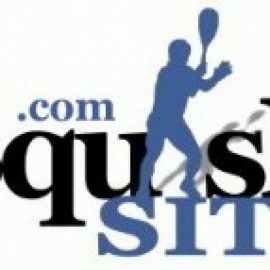 Quarter Finals night at the CSC Delaware Open, provided another entertaining display of squash. It also saw a return to normalcy after the storm of upsets in the first round, with all the higher seeds moving forward. However, this was not to be without some testing matches, none more than the match between #1 seed Samantha Cornett of Canada and American Olivia Fiechter, who play identical games and covered every square inch of court #1 at the Vicmead Hunt Club. The first three games were all very evenly matched before Fiechter ran out of answers for Cornett’s short game in the fourth. 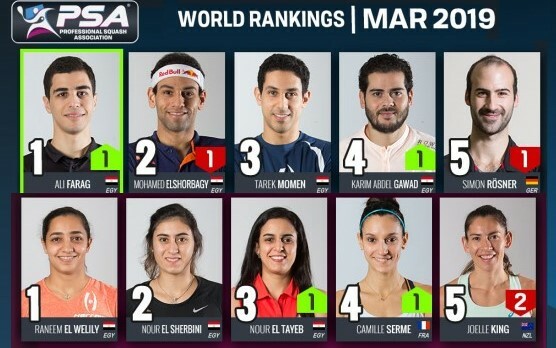 The last match of the night also provided a very entertaining battle with upset winner from Thursday night, Cindy Merlo seemly in control of the fifth game before some lose play at the end allowed her opponent Hana Moataz of Egypt to squeak out a five-set win to earn a trip to the semifinals. There she will face Liu Tsz-ling of Hong Kong, whe advanced with a straight game win over Emilia Soini of Finland, using a deceptive short game and good length. 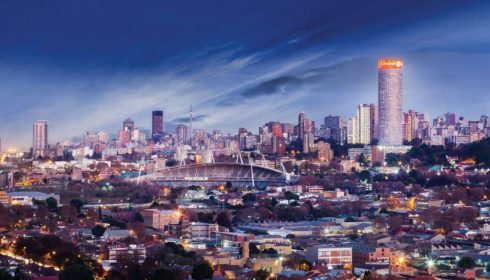 The semi-finals are set for the Saturday with Cornett taking on Lisa Aitken, who beat Eangland’s Lucy Beecroft in straight games, and Tsz-ling taking on Moataz in what will be battle of contrasting styles in both matches. 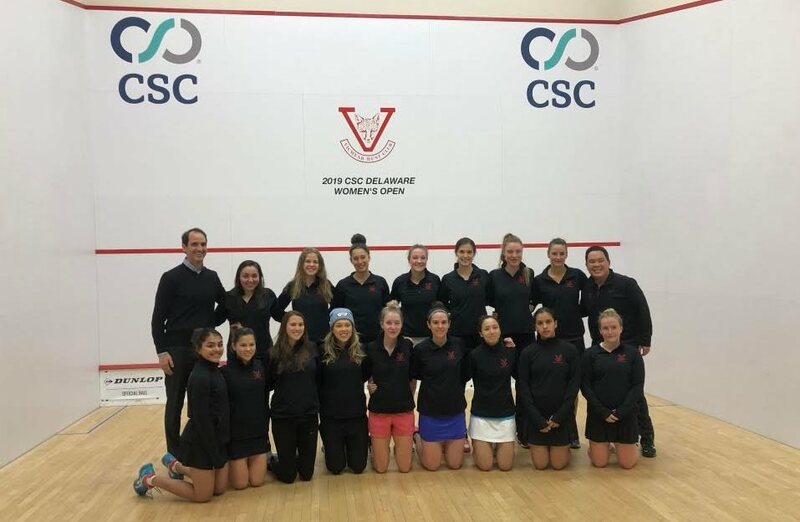 The 2019 CSC Delaware Women’s Open hosted by the Vicmead Hunt Club, got off to a rollicking start tonight with eight first round matches. This is the eighth year that Vicmead has hosted a WISPA/PSA event and this year’s field is one of the most diverse, with fourteen different countries represented in the sixteen player draw. However, the one common trademark from previous years is that you don’t want to be a seeded player at this tournament, as there is usually a ton of upsets. Thursday night did not disappoint in this regard, and it saw three seeds going down to their unseeded opponents. The #4, #5 and #6 seeds all fell in their first-round matches on a very lively Vicmead court tonight. 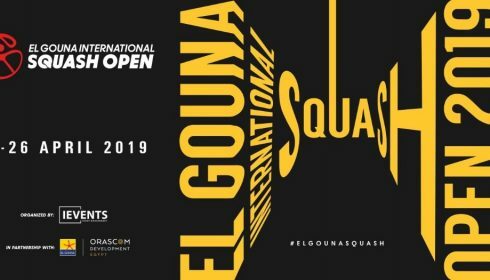 This made for some very entertaining squash, and along with the pure athleticism of some of the athletes, made it very entertaining for the appreciative crowd. Among the upsets Lucy Beecroft of England, who is currently studying at YALE, upset Menna Hamed of Egypt in four hard fought games. She will now have the challenge of facing the #3 seed from Scotland Lisa Aitken in the quarter finals and somehow make her two college matches this weekend. The top two seeds, Sam Cornett and Liu Tsz-Ling, comfortably advanced to the quarter finals and look set to keep going until Sunday, however it will be interesting to see if the Vicmead jinx will set in. Stay tuned!